"Kutaniyaki" is general term for the pottery made in Kaga. Around 1655, There was once gold mine in Kutani village (today:　Kutani, Yamanaka-onsen, Kaga/Ishikawa), which was located in the Daishoji domain (belonging to the Kaga domain), where very fine pottery stone was found. Daishoji domain established Kutani kilns, and they began to make potteries. 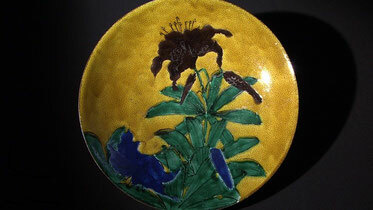 It features glazes using 5 traditional Kutani colors (red, blue, yellow, purple and green). brightly on a one of masterpiece of KUTANI as pictured above. KO-KUTANI (=old Kutani), made in the early Edo period (1655-57). 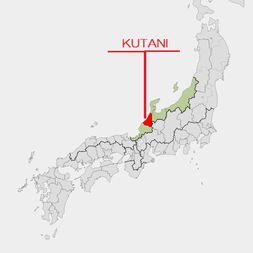 It is the origin of KUTANI. 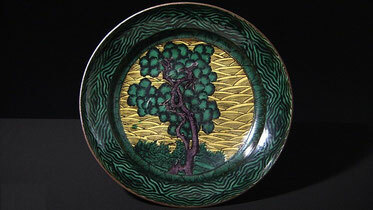 Its artistic style is reminiscent Van Gogh's oil painting. 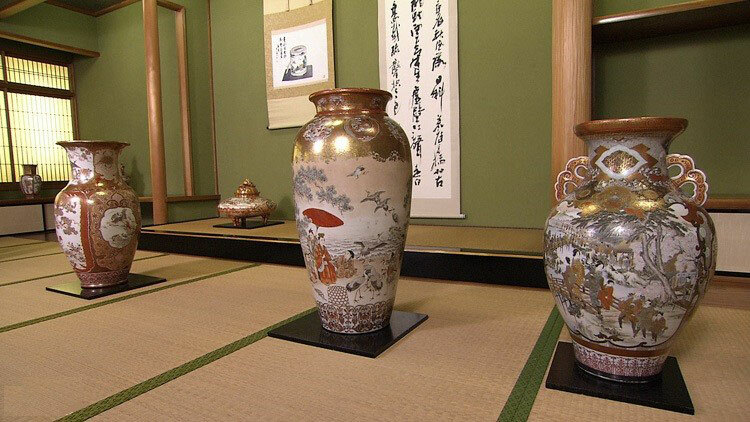 About 100 years later, fortunately the production restarted by the Kaga Clan, who invited many craftsmen and designers from Kyoto and Edo (former Tokyo) and produced various styles of Kutani Porcelain. A fine design appeared. It is the "AKAE (=red painting)" painting in red on a white. Only the red points and lines creat a majestic landscape in perspective. 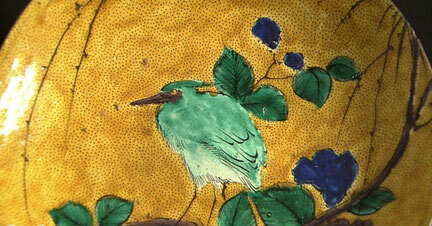 Plenty of KUTANI porcelains have been exported to Europe in Meiji era. It was called gorgeous "JAPAN KUTANI". 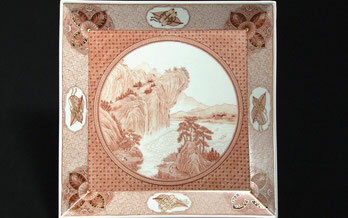 Its oriental pattern with fine technique attracts people in Europe. 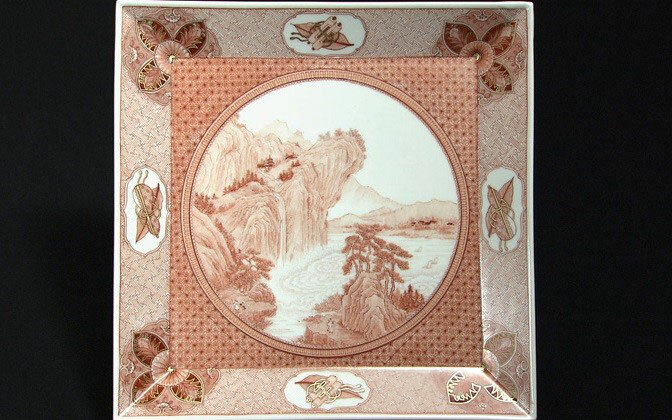 JAPAN KUTANI was the most exported porcelain in Japan at that time. 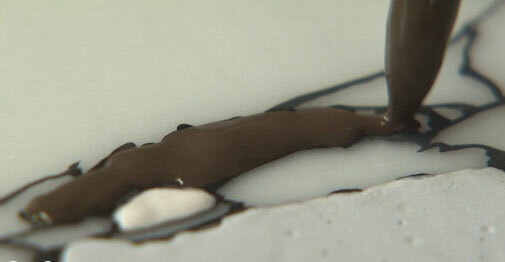 KUTANI's porcelain painters were competing each other how they can draw finer lines and points. Such competition leaded to the artisan skill today. The secret of warm green and yellow color is thick glazing. 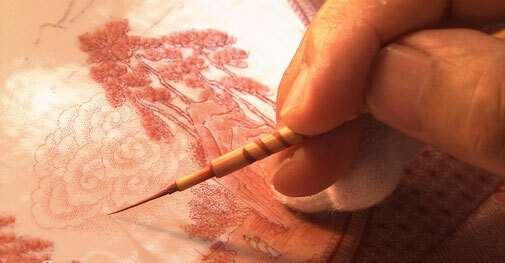 Painting glaze on the sketch very thickly is a traditional method of KUTANI. 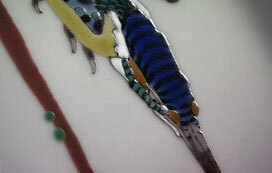 When porcelain is fired in a Kiln, glaze gets beautiful colors. The picture in three-dimentional look appears.